Former Chief Minister Om Prakash Chautala was at the receiving end in the Haryana Vidhan Sabha here today. First it was Congress MLA from Palwal Karan Singh Dalal who fired barbs on his bete noire Chautala while speaking after moving the motion of thanks on the Governor’s address to the house. Nothing unusual strikes one while nearing this village located on the Narnaund-Mundhal road in Hisar district. However, after entering the village, one cannot help noticing a maze of illegal electricity ("kundi") connections dangling against many a rooftop. 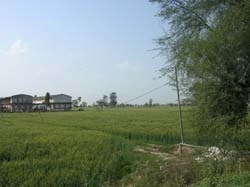 A view of the hatchery located near Khanda Kheri village in Hisar. — Photo by writer. A virtual “silent” revolution is sweeping the countryside in Haryana. Every Sunday an average of six panchayats meet in different villages all over the state and issue fatwas banning the use of DJs, dancing and loud music in marriages. The district police has solved a case in which two accused had embezzled paddy worth Rs 4.25 lakh belonging to a local trader by furnishing wrong identification and changing the number plates of the truck in which they had carried the paddy to be delivered to a purchaser at Bawal. In a democratic set-up, people have the right to know how and where the money paid by them as taxes was being spent as all development activities were undertaken with public money. Haryana Chief Minister Bhupinder Singh Hooda today said damage by the latest spate of rain had been reported from Yamunanagar and Ambala districts. Heavy rain for the past two days has caused substantial damage to the standing wheat and vegetable crops in several districts of Haryana. Though the farmers are worried a lot, agriculture scientists are hoping for a bumper wheat crop due to the “friendly climatic conditions”. Unidentified persons allegedly chopped hair and shaved the beard of a Sikh youth of Model Colony who had earlier gone missing. He was found unconscious along the track near Jagadhri railway station last morning. A nine-year girl, Shikha of Farmana village, went missing under suspicious circumstances on Sunday and on the plea of her parents, a complaint has been registered at Kharkhoda police station. Dead body of an NRI, Harjinder Singh was found under mysterious circumstances from the Skylark tourist complex, Panipat, today morning. Members of author Rakesh Vat’s family, who had met with an accident and is recuperating at Fortis Hospital, today expressed unhappiness over the lack of monetary support by the Haryana Government. Then Chautala was not allowed to speak on the motion by Congress members, who systematically interrupted him one by one. Though for record sake, Chautala was on his legs from 5-47 p.m. to 7-15 p.m., he could not speak for more than 10 minutes. Chautala’s colleagues repeatedly walked into the well of the House when Dalal used choicest adjectives to describe, what he alleged, the arrogance, corrupt practices, protection to criminals, wasting of the state’s resources in UP and Rajasthan elections for political gains of the INLD, systematic erosion of the credibility of constitutional bodies like the Haryana Public Service Commission and other recruitment agencies, subversion of admission process in the JBT course and medical colleges and what not, by the Chautala regime. Dalal said Chautala was even worse then Saddam Hussein and Idi Amin. Congress MLAs, including Shamsher Singh Surjewala, Anita Yadav, Capt Ajay Yadav and Nirmal Singh, BJP member Ram Kumar Gautam and several Independent MLAs like Naresh Yadav supported Dalal. Chautala, during the melee, remained seated with a smiling face, reading several documents, ostensibly preparing for his turn to speak on the Governor’s address. Only once he rose to tell the Speaker that his party members should also be given the same freedom as was being enjoyed by Dalal in addressing the house. Chautala, who was apparently expecting this Congress (read Dalal’s) onslaught against him as this is the first Assembly session he is attending after being voted out of power two years ago, remained unfazed and did not react to even personal allegations levelled against him. He reacted only when Dalal claimed that once Chautala was caught while travelling ticketless in a train. The Congress MLA said he would quit the House if he was proved wrong. Chautala dared to prove his allegation. But the INLD leader was subdued when BJP MLA Gautam intervened to say if it was also wrong that once his father had disowned him after he (Chautala) was caught by the Customs for smuggling watches. Dalal urged the government to take over the Devi Lal Memorial Trust floated by the Chautala family. He also wanted the government to take over Orbit Resorts owned by the Badals in Gurgaon, the land for which was given to them by Chautala’s father Devi Lal. When Chautala rose to participate in the discussion on the motion, the Congress MLAs in a planned manner interrupted him repeatedly. All Chautala could manage to say was that the Governor’s address did not lay down any roadmap for the state’s development, that the government had done nothing to generate more power, and that it had failed to get the SYL canal completed. Repeated interventions by the Congress MLAs showed that their conduct was no better than that of INLD members when they sat on treasury benches. Their conduct is definitely a setback to the promise made by the Hooda Government to restore the dignity of various institutions, including the Vidhan Sabha. A hatchery located on the outskirts of Khanda Kheri village in Hisar district presents a typical example of authorities' helplessness in enforcing the rule of law. The owners of this hatchery are the defaulter of lakhs of rupees to the power authorities. A few years ago, a team comprising power officials and police force went to raid the premises, but returned empty-handed. Following that, the power transformer giving supply to the hatchery was confiscated. However, the owners of the hatchery themselves got a new transformer installed. A little later, the authorities concerned got the supply lines obstructed. Yet again, the owners themselves got the power lines replaced. On being contacted, managing director of Dakshin Haryana Bijli Vitran Nigam Vijayender Kumar asserted that appropriate action would be taken and nobody would be allowed to draw power unauthorisedly. He maintained that Khanda Kheri village would be made a model village as far as the power situation was concerned. Even power officials admit that there are more unauthorised connections in the village than regular ones. And, the pity of the situation is that even most of the authorised consumers are not paying their electricity bills. According to power records, the total default amount of the village till date runs into crores of rupees. What is worse, this amount does not include the cost of electricity being stolen with impunity. As far as the power officials are concerned, they are simply too scared to make the consumers pay their bills. And they have a reason to be afraid. Till recently, the village has been a stronghold of the Bhartiya Kisan Union (BKU). Even now, the power defaulters and those engaged in its pilferage are considered to be an organised force. Residents of this village are notorious for attacking power officials. They have also foiled numerous attempts of cutting power connections on the non-payment of bills. Apart from Khanda Kheri, in several other villages in Narnaund block similar problems are being confronted by the power staff. These include Ugalan, Koth Kalan, Koth Khurd, Dharam Khedi and Kinnar. Alleged connivance of the local police staff with power "thieves" and defaulters aggravates the situation. Collectively, the power defaulters are causing heavy losses to the exchequer and the situation has been so for the past several years. Blame it on vote-bank politics or call it a failure of governance, but no regime has dared to take the bull by its horns, at least as yet. The trend which began from Meham subdivision of this district about two months ago is now catching up elsewhere. Yesterday, similar meetings were held in several villages, including Balla in Karnal district, Buana Lakhu in Panipat district and Narnaund in Hisar district. Representatives of about six surrounding villages also attended the panchayats. Such panchayats issue a common fatwa. Any family in the village allowing the use of the DJ system and dancing in marriages will have to pay a fine of Rs 11,000 to the village panchayat and also face social boycott. In local terms, the boycott means no villager will share ”hukka, paani” with the affected family. The village grocer will not sell anything to the family. The panchayats have ruled that the onus of informing the groom’s family about the ban on DJ and dancing in their village will lie with the bride’s family. This would have to be done at the time of fixing the marriage. Significantly, these panchayats are attended by representatives of each of the 36 communities of rural Haryana to ensure that no community can defy it. Most village elders cite noise pollution and old social traditions as the causes of the ban. Giani Ram of Meham who is among those championing the new cause says traditionally marriages in Haryana’s countryside are silent and solemn affairs marked by good food, lots of sweets and fun and laughter. “Dancing and playing film songs were rightly never a part of our culture. Shehnai is enough,” he adds. Enquiries, however, reveal that the main reason that prompted the ban is that though initially dancing on DJ floors was restricted to youngmen, over the past couple of years, young village girls were also beginning to join the fun on the garish dance floors. This trend pressed the panic button in the conservative rural society resulting in the ban. Several panchayats are going even further. At least, two panchayats yesterday also banned flaunting firearms and consumption of liquor in marriages. However, the villagers say while the show of firearms can be curbed, the ban on liquor may not be a practical preposition for the simple reason that consumption of liquor in the villages is now a routine - marriage or no marriage. Reports received from villages where the ban has come into force indicate that DJs have been replaced by the more traditional brassbands and dholis - the traditional drummers. However, there has been no check so far on the consumption of liquor. Besides, there has been no firing in the air by members of the wedding party. Such firing often led to accidental injuries. The district police has solved a case in which two accused had embezzled paddy worth Rs 4.25 lakh belonging to a local trader by furnishing wrong identification and changing the number plates of the truck in which they had carried the paddy to be delivered to a purchaser at Bawal. The accused, namely Balwant, truck driver, and Narinder, both residents of Moth Karnail village under Narnaund police station, were arrested by the CIA branch and produced in a local court which sent them on police remand. Giving details of the case here today, SSP Navdeep Singh Virk said a local trader Satpal Mahajan lodged a complaint with the police that he had sent Basmati paddy worth Rs 4. 25 lakh by a truck (No.56-1974) on November 7,2006.However, when he went to Bawal on November 9 to collect the payment of this rice, he was shocked to know that the paddy had not been reached the purchaser. On his complaint, a case under Sections 419, 420, 407, 483, 467, 468 and 471, IPC, was registered against the accused who had identified themselves as driver Mohinder, resident of Gangwa, and truck owner Sat Pal, resident of Ram Rai (Jind). They had also furnished their mobile numbers. The police traced the accused on the basis of their mobile numbers and arrested them . Virk said the accused had changed the number plates of the truck on way to Bawal and also destroyed the sim cards of their mobiles phones. They took the truck to their village where it was unloaded at the residence of Narinder. This was stated by Chief Information Commissioner (CIC) of Haryana G. Madhavan while addressing a seminar on the “Right to Information” (RTI) at Panchayat Bhavan here today. Madhavan said this would not only bring about transparency in all public dealings but would also act as deterrent to corruption in public life. Terming the RTI as the most revolutionary step by the Central government after Independence of the country, he said the better this Act was implemented the better empowered would be the people of the country. He revealed that the RTI was in force in 60 countries and it had been able to rein in red tape and bureaucratic hurdles to a great extent. He said so far 400 cases had been resolved under the Act in Haryana. He said that there was the need for proactive disclosure of information under section 4 (1) (b) of the Act. He exhorted the people to shun corrupt government officials for their day-to-day chores. Earlier, welcoming Madhavan, Deputy Commissioner O.P. Sheoran assured him that the district administration would implement the Act in letter and spirit. NGO Participatory Research In Asia (PRIA) convener Shalender said their organisation would work hard to make people aware for their rights under the RTI. SP Saurabh Singh and I.S. Dahiya, Yogesh Mehta and R.K. Garg, SDMs of Fatehabad, Rattia and Tohana, respectively, were also present in the seminar. He said orders were issued to conduct a girdawri in both districts to assess the extent of damage for giving compensation to the affected farmers. The Chief Minister was responding to a call-attention motion moved by the opposition INLD legislators on damage to crops by rain in February. According to the statement read out by revenue minister Ajay Singh Yadav in reply to a notice given by Sushil Indora, Ishwar Singh Palaka and Sahida Khan, crops on over two lakh acres spread over 16 districts of Haryana were damaged by the February rain. Rewari, Panchkula and Narnaul were not affected. The statement said while the wheat crop on over 1.7 lakh acres was affected, other crops (potato, mustard, etc) grown on over 34,000 acres were damaged by rain and hailstorms. The statement said it was tentatively estimated that Rs 70 crore to Rs 71 crore would be required to be paid to the affected farmers. The amount could go up to Rs 75 crore after taking into account the latest damage to crops in Yamunanagar and Ambala, added the Chief Minister. A visit made by this reporter today to villages in Karnal, Kaithal and Kurukshetra districts revealed that crops in Nigdu, Kaul, Dhand, Pindarasi, Tarauri and several other villages had suffered a considerable loss. Vast patches of wheat crops turning pale tell the tale of damaged standing vegetation. Similarly, rotten vegetable plants have made the farmers a worried lot. Experts at the research centre based at Kaul village, Kaithal, hoped a high yield this season. Dr V.P. Singh, head of the centre, said that continued cold weather had given an added time for better formation of wheat grain. He said that the unseasonal rain was good for the wheat. REWARI: A heavy hailstorm lashed Rewari and its surrounding villages on Monday evening. It reportedly damaged the standing mustard and wheat crops in over 20 villages of the Rewari region. There are reports that in some villages of the Dharuhera area the hailstones weighed from 100 to 200 gm each. A large number of birds also perished in the storm. Deputy Commissioner Chanmder Prakash has directed the revenue officials to conduct a special girdawri of crop losses in all the effected villages. He said as soon as the report of the girdawri was available, the hail-hit farmers would be given adequate compensation. Although the police has started investigations in the matter it was yet to receive a formal complaint from the victim or his family. SP K.V. Ramana said that the police had not received any complaint till this evening. Jasbir Kaur, mother of victim Ratanjeet Singh, alias Puneet (24), said that her son was yet to regain senses. He had left his house on February 24 for Saharanpur in Uttar Pardesh to purchase articles for his rehri. When he did not return home till late evening his family members started looking for him. Later a missing person report was lodged with the police. According to the police, the girl went to a shop of her uncle Narender in the village to hand over a meal-box on Sunday noon. But after keeping the box in the shop, she did not return to home. After searching her in the village and other adjoining villages till late last evening, her parents lodged a complaint with the police suspecting that she might have been abducted. According to the police sources, the 46-year-old deceased was staying at the state government-run hotel for the past few days. His body was found from room no. 109 by the hotel staff. He was overlooking a construction work of his newly acquired residential accommodation at Model Town, Panipat. Family of the deceased is reportedly settled in Canada. Meanwhile, the police had registered a case. Balkesh Vats, son of Rakesh, said not only no monetary help had been given to the family, but also no government official had inquired after his father. Rakesh had met with an accident near Pinjore in February. He has been undergoing treatment for the past 12 days. Balkesh said whatever money their well-wishers collected had been used in the treatment. Rakesh is a member of Central Academy, New Delhi, and had recently been honoured with Sur Puraskar. A scholar had completed his PhD on the works of Rakesh.